View more documents from kenhalla. You should have now (or will today) receive the latest newsletter from the Spiked Shoe Society. It is put together entirely by volunteers and paid for with donations to the track/xc team. We do need more volunteers, though. If you are interested in helping with fundraising, please e-mail kenhalla@gmail.com. To donate click on one of the tabs to the right of this post and you can give electronically. Thanks to Shelby Hawthorne for all the party pictures. Emil Davis is back to video taping. Here are some of the CNU performances starting with Katie Guevel in the 55H, Emily Jeremiah in the PV, Dan Klazkin in the SP, Doug Zimmer in the PV and above is Nicole Kazuba in the pole vault. Hot off the wonderful cross country finish, the team had a number of great performances at the CNU Holiday Opening. Go here on Saturday for the race results. The men are at 10 and the women at 11. Look for the men to field only a small part of their top seven as they gear up for the national qualifying race in two weeks. The Letsrun.com poll has the men ranked 9th and the women 52nd in the country. Now that W&M's women have been to the NCAA meet a number of times and had a number of All-Americans, it is hard to believe that the first team started in 1977 and was coached by Randy Hawthorne (with help from Baxter Berryhill). Listen here for my interview with Randy and come back in a few days for some pictures. The sound gets better about 30 seconds into the interview. Above are some of the earliest members of the women's xc team from 1977: Laura Sardo Fleming Jeanne Hopke and Joy Kelly Stiles. The men remain 9th in today's poll. Stanford, coached by W&M grad Jason Dunn is the top ranked program in the US. Men on top and the women on the bottom. The women were 15th in the white race at pre-nats with Emily Anderson leading the way in 29th. Race video will be up later. The men's race is done and three finished in the top 25, but Massam was back. Jon Grey was 5th overall and the men were 4th overall with Oregon running away with the team title. More coming. The new poll came out and surprise, the men are still ranked #9. On Saturday the men and women will be on the NCAA course and looking to improve on their impressive races from two weeks ago. Flotrack will be there and the results will be here. The men will race at 11 and the women at 12:55. Okay, let's see if I can get this straight. The USCCCA Association agrees with Letsrun.com and ranked the men's team 9th in the US in their rankings that came out today. The men are also ranked 1st in the region. The women are unranked nationally and are 5th in our region. The rather well visited site, LetsRun.com today ranked the men 9th in the US (still waiting for their women's poll). Ranked #1 was Oklahoma and #3 was NAU which was only 7 points ahead of the men's team at the Jamboree meet. W&M has had several teams in the top 10 at the NCAA meet including a high of 4th in 1973. The pre-national meet in two weeks will tell if this ranking can continue further in the season. A week ago the coaches' association ranked the team 13th. Tomorrow the men's and women's team will be at the Cowboy Jamboree which will have video coverage here at 10:10 am and the men at 10:45 am (EST). Above is a video look at the course. 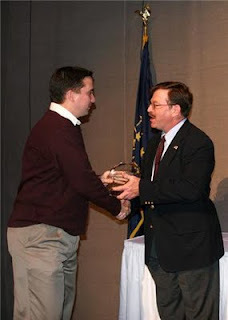 For those of you who ran in the 1980, you will well remember coach Jim Goggin (who is still teaching in Williamsburg). Well, his wife, Debbie Boykin, is featured in this month's alumni magazine. Yes, that's right, pre-season since most of the teams have not let their top runner get in a race yet. Here are the XC women that Coach Newberry recruited. Gibby was hard at work last year getting all the new XC recruits which you can read about here. Gibby and Newberry who traditionally wait until late in Sept to start the season actually let a few of their athletes run today in an XC meet. The men were second to URichmond (enough said about how many athletes didn't run) and the women were second as well. Come back in a few days for the bios on "the new kids" and a few days later we'll have an interview with the coaches. Leading the way were Alex McGrath and Liam Anastasia-Murphy for the men and Brittany Sevachko and Robin Vanneman for the women. In a few days you will be receiving our semi-annual newsletter. If you want read it digitally, please click here. 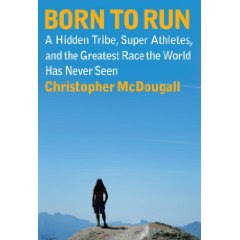 Normally I wouldn't plug something twice, but the book, Born to Run, still is on the NYTimes bestseller list. I have to admit, I didn't think I would enjoy a book about ultra running, but it is GREAT even though you won't agree with everything in it. The interview above is from one of my former classmates, Jon Stewart Lebowitz! Of the 25 people who were selected for the first quarter century team for the CAA, 16 came from W&M. Mike Brown – Virginia Beach, Va. -Earned All-CAA honors and was part of championship teams during all four seasons at W&M -Selected as the CAA Rookie of the Year in 1994 -Placed in the top five at four consecutive CAA championships, including third place in 1995. Betsy Graney's qualification for the NCAA meet with her fifth place at the NCAA regional in 10:22, brings the total to four who are going to the NCAA meet with automatic qualifiers. Harry Miller also was 16th overall in the steeple in 9:18 while Ashley Williams was 27th in the shot put. Graney will join Fitzgerald, Anderson and Kazuba at the NCAA meet. There are several who are waiting for possible at-large bids: Jon Grey (5&10K), Katie Guevel (heptathlon), Brandon Heroux (javelin), Lynn Morelli (10K) and Cam Shriver (high jump). Nicole Kazuba finished in 2nd to auto qualify in the pole vault. All-American Emily Anderson finished 3rd in 16:08 automatically qualifying for the NCAA meet as did Ian Fitzgerald who was also 3rd in 14:15. Both have gone to the NCAA meet in the 1500/mile so will have the advantage of having extra speed to wield against the distance types. Also Jon Grey was 8th, Colin Leak - 22nd and Christo Landry - 23rd. For the women, Lynn Morelli was 33rd and Kayley Byrne was 36th. Super frosh Natalie Baird was 18th overall, but still has the USATF Jr. meet to look forward to in a few weeks. First off, Heroux is ONLY a frosh and already the school record holder. Today he topped this by finishing 7th in the regional meet (although his PR would have put him 3rd). The top five automatically qualify and he still has a shot at going to the NCAA meet. He also will be going to the USATF Jr. meet and will be one of the favorites there. In the 1500, Emily Schroeder was 9th in her heat in 4:31 while Brian Sklodowski ran 3:55 for 8th in his heat. More to come later tonight. Live results are here. 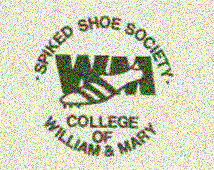 For those of you who are new to this site or new to Facebook, we have a page under "Spiked Shoe Society." 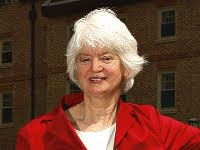 Kristin Shiring will give you regular updates and it is also a way to connect or re-connect with fellow alums. Ali Watson is back from having her first child in March and here interviews Jon Grey who ran 28:55 earlier this month to move to #3 on the all-time 10K. In this interview he talks about his future plans, the 10K and his regional goals. Nicole Kazuba came in 2nd in the ECAC pole vault where she has four times come in second. Natalie Baird also earned All-East accolades with her 6th in the discus. More on the women and men Most of the events have their finals today. Here is the schedule for the two meets this weekend. On top is the 5K with Emily Anderson and below it is Jon's 10K. 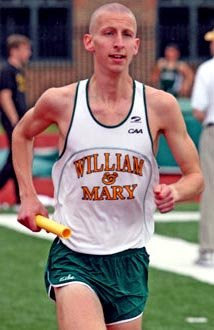 Soph John Grey ran 28:55.48 which make him the 3rd fastest performer in W&M history. Even better I am the only person to break 29 before being a senior and no soph has ever done it. So perhaps Jon will continue his arc of improvement and nab the #1 time before graduating. His time is a provisional NCAA qualifier, but will certainly hold up for the NCAA meet. Emily Anderson ran the 2nd fastest time on the East Coast with her 16:10 which is a NCAA regional qualifier and the 2nd fastest in W&M history (performer wise). Finally Ian Fitzgerald also qualified for the regional meet with a 13:56 in the 5K which you can see above. Will Tarantino '05 (see the post a few days ago on him), while not happy with his results, still ran a 2:30.25 for 57th place at the London Marathon. On top is the men's race and the women are below that. The men were 5th in 7:33 in the college division and the women were 4th in the championship heat (watch it as Tenn sets a world record) while Brandon Heroux was 4th and qualified for the NCAA regional and IC4A meets. You can see ALL the races by going here and toggling all the way to the bottom where it says "track races." Anastasia-Murphy Wins the Tough Guy Award! Above is frosh Liam Anastasia-Murphy who here fell in the steeplechase at Penn and despite swallowing some water, still got up and qualified for the US junior champs. Above is an interview with him. Here is the race where Graney was 4th. This is a video taken at the water jump each lap. In the past few years, three individuals have stepped forward with tremendous donations. They are the Showker Family and the Community Foundation of Harrisonburg who funded the throwing circle, Pat Cousins who paid for the start line and Juan Conde who named the finish line after my coach, Roy Chernock and one of my teammates, Marlon Mattis (whose son is featured a few posts ago). If you go here, you will see a brochure on the many other naming opportunities. Obviously these are big ticket items. For $500, you can also buy a brick outside the stadium or you can make a contribution of any amount by going here (make sure you designate it for track or xc) or by sending a contribution to "Spiked Shoe Society," PO Box 399, Williamsburg, VA 23187. In many ways this story on Will Tarantino '05 is very sad. He does have a malignant brain tumor and gave up pursuing a PhD because of it. On the other hand, he is not giving up on life will be running in the London Marathon this weekend. 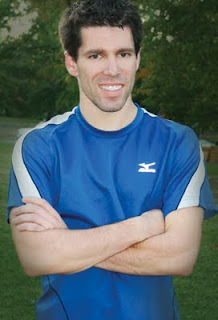 At W&M he was a 3:50 1500 meter runner and last year ran a 2:29 at the Boston Marathon (just off his PR of 2:26). Click here for his story. You can also go here to see his webpage where it tells his complete story and also is a fundraising source for brain cancer research. I'll follow up as soon as I know how Will does this weekend. Thanks Coach Davis for the pictures. Above are ones from the distance races. Here are ones celebrating the 1st and 2nd place team performances, the heptathlon, the jumps, mid-distance, sprints and the throws. Okay, this may open the flood gates, but so be it; send them to me if you have great performances from your offspring! Marlon Mattis '85 was one of my teammates (he used to spot me when we lifted by using one finger) who is now #3 on the all-time hammer throw. It seems that the hammer doesn't fall far from the tree as Sam Mattis set a NJ frosh record in the discuss with a toss of 169'6. See the video above of the throw and a short interview above. I'm still waiting for pics from Colonials, but in the meantime, here are a few more details on the Tribe victories last week thanks to Rick Platt and his article in the Virginia Gazette. For us old-timers, it seems odd to say "Tribe wins," as the meet has changed over the years. When I was in school in the 1980s it was the second biggest relay meet in the country spanning three days and included high school, college and post collegiate athletes. Now it is a very competitive meet where the tribe can show case its well rounded (esp on the women's side) team. Fifty-five athletes earned ECAC qualifiers and eight earned a ticket to the NCAA regional for the women and for the men 75 earned a trip to the IC4A meet while seven secured a place at the NCAA regional meet. Rather than rewrite a nice article, to see the women's story go here and here for the men's team. Great job by all. Come back later to see a mess of pictures as well as some interviews from Coach Davis. If you have the url for the women, please put it in a comment. But here is the last part of Moran's race last weekend and it does show Ed finishing (8:44). Colonials is underway. Check out the link below this post. Click here for live results on Friday & Saturday. Here are some nice videos from Coach Davis. First we have Chris McIntosh who ran 55.61 and Matt Heidman with a 57.52 in the 400 hurdles, Katie Guevel in the 100 meter hurdles where she ran 14.50, Lynnie Bresnehan in the triple jump, Cam Shriver in the high jump as he clears 2.00 meters and above is Brandon Heroux's winning javelin throw (and W&M). For the men, Brandon Heroux broke his frosh javelin record with a todd of 221, mkaing him #2 all time at W&M and once again qualifying for all the post season meets. Lian Anastasia-Murphy also ran a 1:54.54 for second while Cam Shriver jumped 6-6.75 for 3rd. 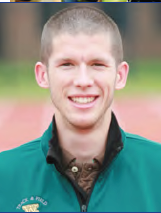 As a former 10,000 meter person, I love it when a W&M runners run great 10Ks and Jon Grey did just that last night in 29:25 which gets him to the IC4A and provisional NCAA . 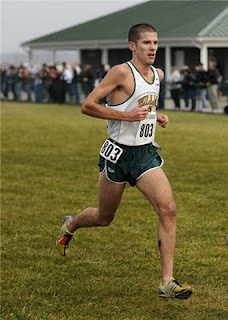 Colin Leak ran 29:43 in the same race. They now are 7th and 10th on the all-time W&M list. For the women, Lynn Morelli ran 16:49 and qualified for the NCAA regionals while Meghan Burns and Kayley Bryne ran 17:04 and 17:05. Ed Moran finished 60th at the world xc race while Kathy Newberry was 40th. Pre-NatsMen on top and the women on the bottom.